All products are 100% natural, are certified Vegan, and are not tested on animals. No artificial colorants; no chemical preservatives; no synthetic fragrances. Featured items include Premium Soaps with custom-printed labels and Pure Soap™: Five bars for $18.99.00! No minimum order requirements. Autumn weather can leave delicate skin dry, itchy, cracked, and chapped. All soaps crafted by Pallas Athene Soap contain glycerin (a natural humectant) to prevent dry skin and most contain natural antioxidant vitamins E, C, & A to help prevent cellular damage to skin from free radicals. Aloe Extra, L-Lysine Philanthropic Soap™, and Only Lavender handmade natural soaps are a great way to start a summer day! Aloe Extra Premium Soap™ contains aloe vera gel, aloe vera oil, and aloe vera blossoms. This aloe vera trifecta is unscented to be mild enough for all types of sensitive skin. Each bar of L-Lysine Philanthropic Soap™ contains 160 mg of the essential amino acid L-Lysine. Additionally, L-Lysine Philanthropic Soap™ contains lemon balm (Melissa officinalis), carrageenan from red seaweed (Palmaria palmata), and dragon's blood (Dracaena draco) essential oil. Use this gentle soap when bathing to cleanse the entire body and leave skin soft. Only Lavender Premium Soap™ brilliantly incorporates dried organic lavender flowers for texture and organic lavender essential oil for scent. Abounding with organic lavender, Only Lavender Premium Soap™ is pleasing on a daily basis, and is a blessing to anyone who loves fresh lavender. Create a relaxing day for someone special by making a gift of Dead Sea Spa Bar and Relax (Chamomile & Poppy) Premium Soap™. Indulgent Dead Sea Spa Bar Premium Soap™ is a papering and effective spa treatment bar. Peaceful Relax (Chamomile & Poppy) Premium Soap™ was aromatherapeutically created to promote relaxation. Relax features dried chamomile flowers, organic poppy seeds, and valerian essential oil along with lavender and lemongrass essential oils for a gentle lemony scent. Soapmaking Classes in Lemon Grove, California! Most Sundays year-round, Pallas Athene Soap master soapmaker Kerri Mixon teaches soapmaking classes at the Soapmaking Studio, located at 7301 Mount Vernon St, Lemon Grove, CA 91945. Soap Makers' Luncheon in San Diego, California! On Sunday, October 14, 2018, Pallas Athene Soap staff will attend the next of the Soap Makers' Luncheons. The Soap Makers' Luncheon will be held at 2:00pm in the Marie Callender's restaurant in San Diego. The Soap Makers' Luncheons are free and open to anyone with an interest in handmade soap. Gift Soaps for Christmas! To receive gift soaps in time for Christmas, please complete purchases by Tuesday, December 18, 2018, to allow for packaging, shipping, and delivery by Saturday, December 22, 2018. To purchase holiday soap gift sets with holiday greeting labels, please visit the Holiday Gift page. Soap Makers' Luncheon in San Diego, California! On Sunday, April 14, 2019, Pallas Athene Soap staff will attend the next of the Soap Makers' Luncheons. The Soap Makers' Luncheon will be held at 2:00pm in the Marie Callender's restaurant in San Diego. The Soap Makers' Luncheons are free and open to anyone with an interest in handmade soap. I have posted a free version of my popular Body Butter lotion recipe. Body Butter is an all-natural, nutritive, emollient skin lotion that does not contain chemical preservatives, synthetic fragrances, or other artificial ingredients. This nutritive recipe is quite easy to make and enjoy at home. This lotion recipe is the property of Pallas Athene Soap™ and may be printed "as is," without alteration and without removing the Pallas Athene Soap™ logos. The lotion recipe is for personal use only. The actual recipe and the lotion made from this recipe may not be sold for profit or otherwise. This recipe is presented in PDF and will open with Acrobat Reader. For more free recipes, please visit the Pure Soap™ page. These free southern California Soap Makers' Luncheons are intended to introduce and promote the creation and use of handmade natural soap, to motivate soap makers, and to serve as a network for both cold/hot process and MP soap makers, whether novice or professional. These meetings are free and may be attended by anyone with an interest in handcrafted soap. Chart of Saponification Values for Making Soap! Our chart of saponification values (for determining the amount of lye needed to make soap) is one of the most accurate on the Internet. This project involved contacting dozens of oil distributors and processors in 2006 and averaging the true SAP values before calculating the saponification values for lye (sodium hydroxide). The chart of saponification values, along with a brief explanation of terms and calculations, may be found on the Certified Lye™ website: Chart of Saponification Values. "The Chemistry and Properties of Fatty Acids and Oils"
Pallas Athene Soap's Master Soap Maker, Kerri Mixon, was one of the featured lecture speakers during the annual soap conference in Raleigh, NC, in May 2013. Her presentation, "The Chemistry and Properties of Fatty Acids and Oils," was attended by soap makers from around the world. Her lecture presentation will remain available on the Internet indefinitely: View Lecture Presentation for Raleigh. Published Articles, Especially for Soap Makers! As a member of the Handcrafted Soap Makers Guild, I have written several articles about making soap, to share with other soap makers. The following articles were written for and published in "The Handcrafted Soap Maker, The Journal of the Handcrafted Soap Makers Guild." These articles are presented in PDF and will open with Acrobat Reader. Tips and tricks for making and storing soap in hot weather. Published in Winter 2009. 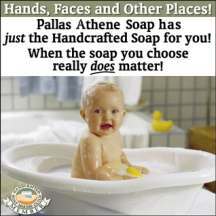 © 2009 Pallas Athene Soap. Published in Fall 2003. © 2003 Pallas Athene Soap. Tips and tricks for prolonging the scent of essential oils in soap. Published in Winter 2003-2004. © 2003 Pallas Athene Soap. Bad personal experience with micas. Published in Summer 2004. © 2004 Pallas Athene Soap. A summary of how scents are extracted from plant materials. Published in Fall 2007. © 2007 Pallas Athene Soap. A quick reference guide to natural scents. Tips and tricks for preventing the formation of soda ash on the soap surface. Tips and tricks for making soap with vegan ingredients. Published in Spring 2004. © 2004 Pallas Athene Soap. General color categories and terms, such as "dye, pigment, inorganic, organic, natural, synthetic." Copyright © 2000-2018 Pallas Athene Soap. All rights reserved.